A truly unique insight into the impact the Second World War had on the iwi of the central North Island and Bay of Plenty districts (including Te Arawa, Ngati Tuwharetoa, Tuhoe, Whanau-a-Apanui, Ngati Maru and Ngati Paoa) focusing on the region's war effort not only overseas, but also at home and in government. 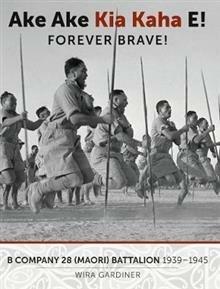 Through personal recollections, eyewitness accounts, numerous anecdotes and highly illustrated throughout, the book tells the fascinating story of the B Company's war, capturing the special `spirit' of the Maori Battalion. Features over 200 images, many not seen in print before, plus hundreds of portraits of the men of B Company (650+ our of approx 900 who served) generously provided by whanau. Lieutenant-Colonel Sir Harawira Wira Tiri Gardiner, KNZM, is a former professional soldier, senior public servant and writer. He was contracted to write B Company's history in 2015. His tribal affiliations are Ngati Awa, Ngati Pikiao, Whakatohea and Te Whanua-a-Apanui.